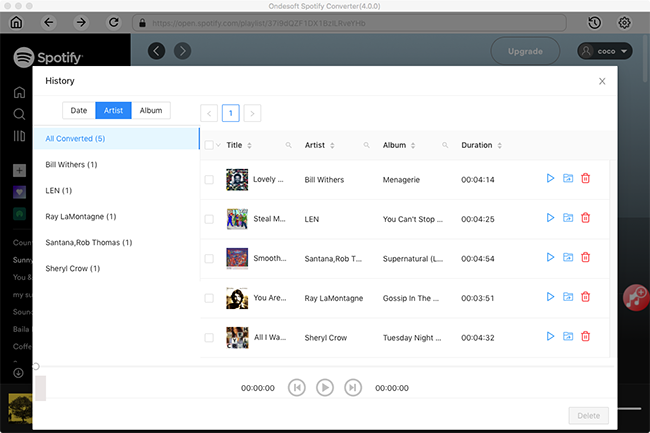 Ondesoft Spotify Music Converter for Mac allows you to easily download and convert any Spotify songs, albums or playlists to MP3, M4A, WAV or FLAC with 100% original quality. The user-friendly interface supports drag&drop and copy&paste. 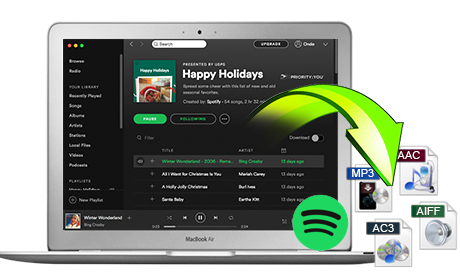 Use this Spotify music converter to download Spotify to mp3 and enjoy Spotify music on any Mac, Windows, iOS, Android, TV, MP3 player, CD player etc. without any limitation. Download Spotify music with free or premium subscription. Convert Spotify songs, albums or playlists to MP3, M4A, WAV, FLAC. Keep ID tags and metadata information to output DRM-free songs. 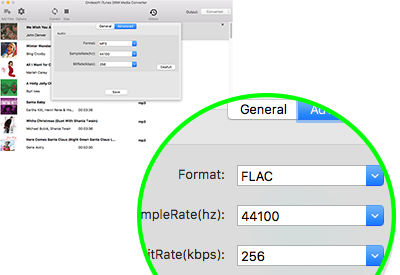 Customize output audio quality according to your needs. Preserve 100% original Spotify music quality. Want to convert Apple Music to MP3? Try iTunes Converter for Mac. Convert iTunes M4V movies and TV shows, try iTunes DRM Media Converter. 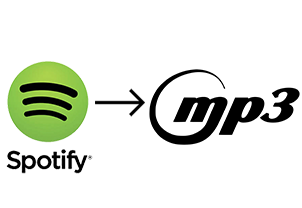 With Spotify Premium, you can only download music on a maximum of 3 different devices. Not to mention you can't download songs at all with a free subscription. 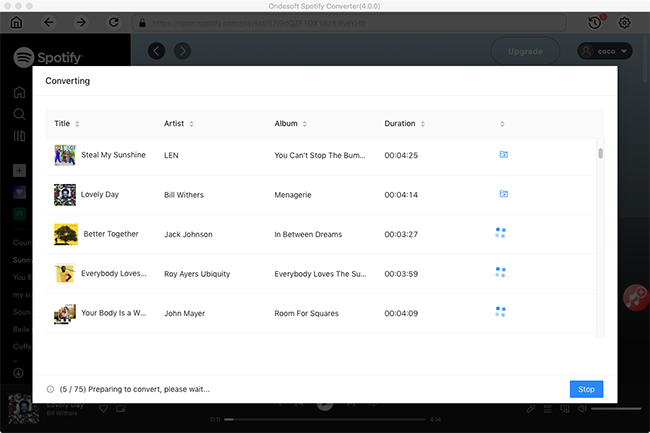 Ondesoft Spotify Music Converter is designed for you to download and save Spotify music to your Mac, whether you are a free or premium user. Spotify songs are in Ogg Vorbis format, which is DRM protected and can only be played with spotify app. 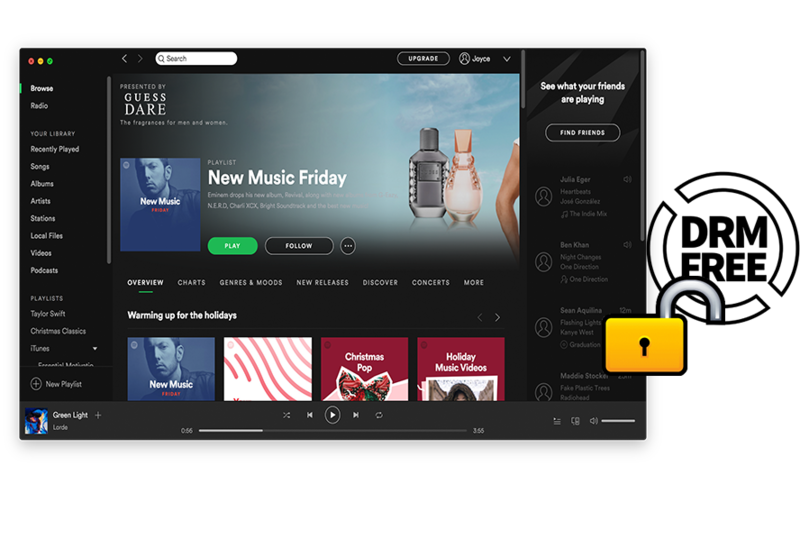 Ondesoft Spotify Music Converter helps you remove DRM from Spotify streaming music so you can play the DRM-free music anywhere you want. Spotify music converter helps you convert Spotify songs, albums or playlists to MP3, M4A, WAV or FLAC. 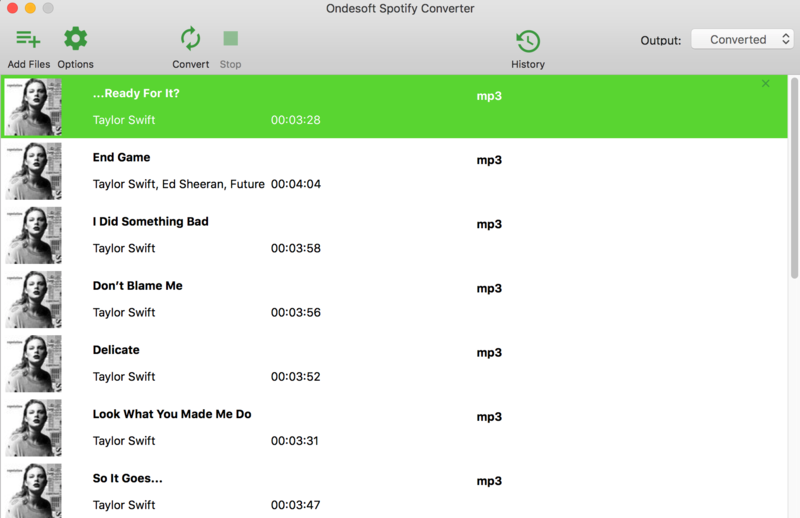 Just drag the song, album or playlist you want to convert to MP3 to Ondesoft Spotify Converter Music interface. 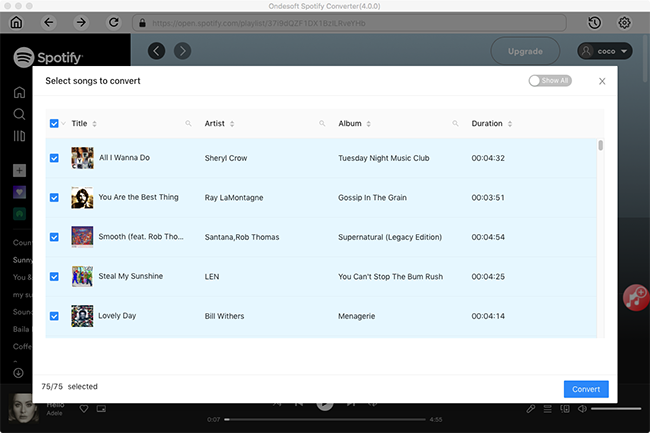 Ondesoft Spotify Music Converter will automatically load all songs in the album or playlist. 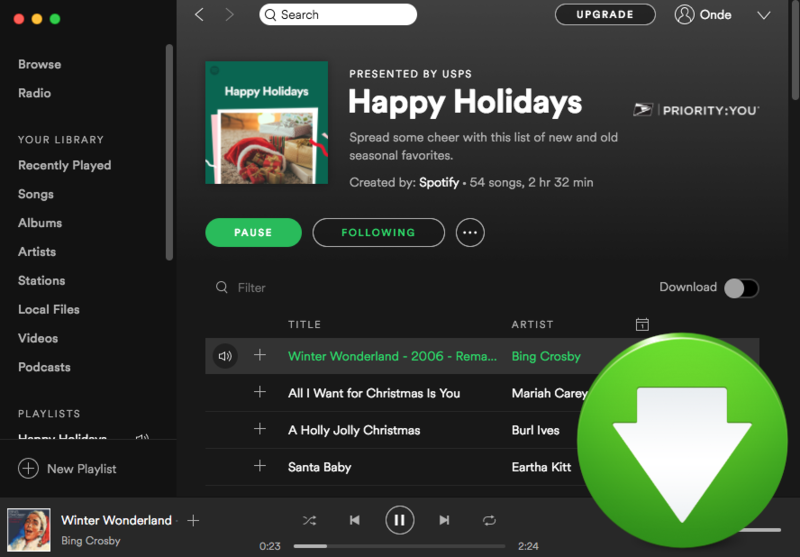 After conversion, you can enjoy Spotify MP3 songs anywhere you want without Spotify app. 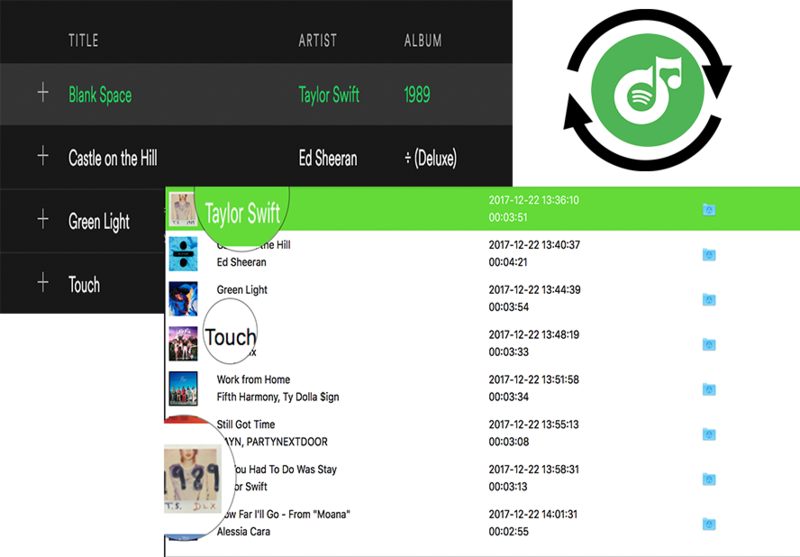 Ondesoft Spotify Music Converter records streaming Spotify music and converts Spotify songs to MP3, M4A, WAV, FLAC with all ID3 tags and metadata preserved. You will never lose the title, artist, album and artwork, etc. Convert Spotify music to MP3, M4A, WAV, FLAC and customize audio quality as you like. 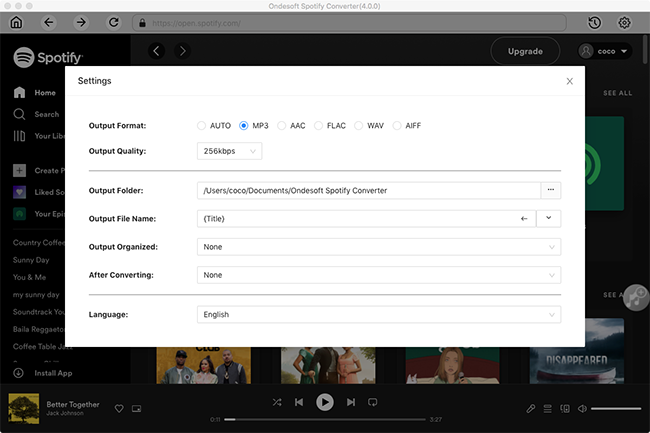 Ondesoft Spotify Music to MP3 converter allows you to set bitrate, sample rate for output DRM-free Spotify music according to your preferences. This Spotify music converter is extremely easy use. With it, I can save as many Spotify songs as I like. Just drag& drop the song, album or playlist. Also it keeps 100% original quality. Thanks to Spotify music converter, now I can transfer Spotify songs to my mp3 player freely. It also perseves ID3 tags. 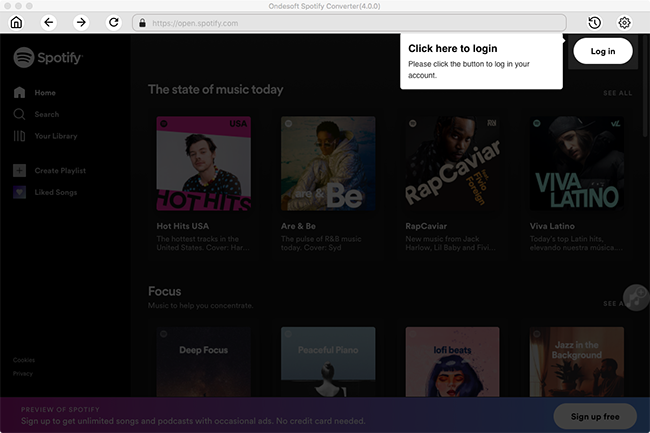 Definitely a fantastic tool any Spotify subscriber should have.